The challenge as far as student recruitment and admissions is concerned isn’t necessarily coming up with ideas for marketing campaigns or even executing them, it lies in how to convert interest from campaigns into real enquiries and subsequent applications. In order to maximise the ROI of a student recruitment campaign, you need a user-friendly software system that will generate simple enquiry forms on the front end, as well as succinct processing tools for administrators to use behind the scenes. Time is very much of the essence in today’s world; universities need to respond to an applicant’s activity instantaneously or risk disengagement. You can use FULL FABRIC's Origin to create the student portal. Students will begin their application's journey through this portal. The system also integrates with LinkedIn and will populate the students' application with their individual’s LinkedIn information, should they wish to do it that way. Inside the portal, the use of dynamic content automatically changes the text displayed to coincide with what stage of the process the applicant is at. Triggered updates can be sent through the portal or via email, notifying applicants of deadlines and other important considerations. This way, the user can easily track their progress. Integration with Google Translate also gives the user the option to change the language displayed on the screen. Applicants can resume their application at any stage before the deadline and all progress is saved automatically. The system is mobile responsive, enabling applicants to fill it out on the move. Collecting references can be very time-consuming for admissions departments, but student admissions systems make it easier by enabling the university to send collect references automatically. There is also the option for students to be notified when a reference has been submitted to keep them up-to-date with what’s going on, and automatically informing them of next steps. University staff can perform a multitude of tasks through an integrated student admissions system. Once logged in, staff members can navigate the dashboard to access a wealth of data relating to the application process, from the number of applicants and their demographics, to a more granular breakdown of student statuses, and where they stand on the application funnel (i.e. ‘cold’, ‘engaged’, ‘qualified’ or ‘started application’). All applicant lists can be exported. ‘Cold’ contacts may have downloaded a brochure from the university website, so the next step would be to ‘engage’ them through a follow up activity and targeted marketing. Another great feature is the ability to chart an individual’s engagement with the university, from how many campaigns they have received and opened to how many events they have registered for and attended - all of this information is visible on the admissions platform. 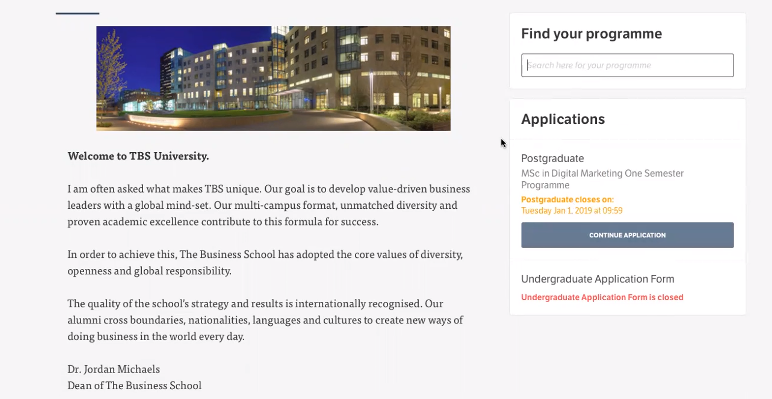 There are a number of ways to engage applicants; Copenhagen Business School uses brochures to capture the details of students into the CRM system and start their admissions journey. Brochures are a great incentive for students to submit their details because they are getting something useful and tangible in return for their information. Brochures can be physical or delivered in an ebook format. 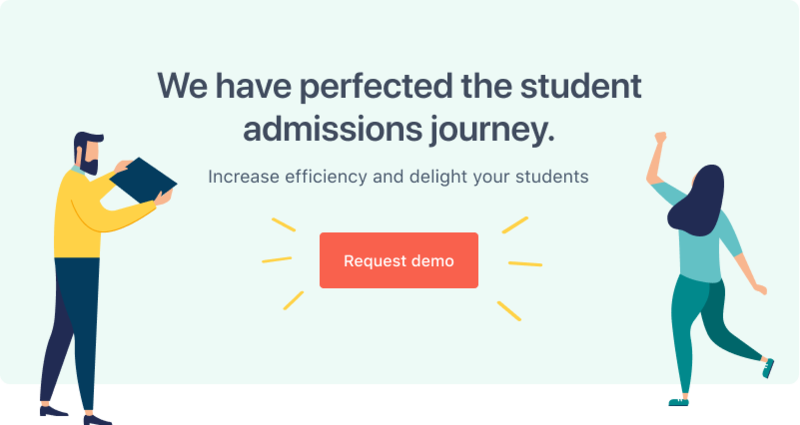 Once the brochure is designed and ready to go, you can use the admissions software to create and embed a form on your university’s website or on a dedicated landing page. Besides storing applicants data, another main thing a student admissions system does is enable your institution to interact with everyone on the database, in a timely manner. Firstly, you can build segments out of a range of factors, such as nationality, gender and application status. Once you’ve refined a segment, you can create an email campaign using a template and schedule it for the best time for maximum engagement. Note: Segments will update in real time as applicants are added to the system and their statuses change. Once you’ve used a template to design your email, you are ready to send! This can be done instantly, or scheduled for a different time. Shortly afterwards, you can analyse the result and check Key Performance Indicators, such as open rates and click throughs. At this point, you might want to schedule a follow-up campaign for those who did and for those who did not open. Aside from saving a lot of time, operating from one centralised admissions system means there is more transparency and you are a lot less likely to lose valuable data. It also enables admissions professionals to organise their workflows better, and have a complete insight into every aspect of the application cycle, from start to finish. If you have a lot of great ideas but need the right tools to be able to build them into your student recruitment campaign, speak with FULL FABRIC about how Origin can help your institution thrive.